“There’s not a moment in the day that goes by when I remember why I was this detour, magic marker-ed on somebody else’s map/Why I squandered my resistance on a dead hand, if I’m here does that make me a better man.” That’s Peter Holsapple on “Better Man,” a song off his new majestic album Game Day. He may not be a household name, but Peter Holsapple has been at the forefront of myriad music scenes for decades. Born in Greenwich, Connecticut in 1956, his family relocated to Winston-Salem, North Carolina just in time for elementary school. At age eight he began playing guitar, by the time he was attending boarding school at the elite Exeter Academy, (where he became fast friends with future Tom Petty Heartbreaker, Benmont Tench), he had become enamored with the Glam/Glitter sound of Mott The Hoople. He returned to North Carolina in 1972 and formed his first band, Rittenhouse Square with old friend, Chris Stamey and local wunderkind, Mitch Easter. They recorded a very enthusiastic EP, and then re-grouped with drummer former schoolmate and drummer Will Rigby as Little Diesel; that collaboration resulted in a one-off local release on 8-track. Shambolic and chaotic, it was the very essence of Garage Rock, but it paved the way for his next great musical adventure, the dB’s. Chris Stamey initially formed the dB’s in New York City with Will Rigby on drums and Gene Holder on bass. Peter had been fronting the H-Bombs, but when that went south he became the final piece of the dB’s puzzle. Signed to Albion, a U.K. record label, the band released their debut, Stands For deciBels in 1981. A fizzy blast of Power Pop, it was a hit with critics and soon the four-piece was touring with bands like Bush Tetras, the Fleshtones and the Bongos. Their second effort, “Repercussion” arrived in 1982, but not long after, Chris left to pursue a solo career. The dB’s soldiered on as a trio, and recorded their third album, Like This.” Foundering a bit, the band added and subtracted members, suffering the requisite record label woes before Chris rejoined the band and they signed with the IRS label. 1987 saw the release of their most accessible effort, The Sound Of Music. A great record (featuring the nonpareil guest vocals of Syd Straw,) it never broke through commercially and the dB’s quietly called it quits in 1988. It turned out that the dB’s brief, but protean oeuvre left its mark, influencing up-and-coming artists like Matthew Sweet, Smithereens Fountains Of Wayne and R.E.M. In fact, the dB’s had acted as openers for R.E.M. on a couple of tours so it seemed only natural that Peter would join the Athens, Georgia four-piece on the road as their touring guitarist. He stuck with the band a few years, helping to shape their breakthrough record, Out Of Time. Beginning in the late ‘80s, Peter was in-demand, playing sessions for indigo girls and Syd Straw and touring with Eric Ambel, just to name a few. In 1991 he and Chris Stamey reconnected and recorded a remarkable duo album, Mavericks. A year later he joined the ragged-but-right, Roots Rock super group, the Continental Drifters. The band originated in Los Angeles and initially included Dream Syndicate bassist Mark Walton, New Orleans natives Carlo Nuccio and Ray Ganucheau. The line-up also went on to include former Bangle Vicki Peterson and the amazingly talented Susan Cowsill. Peter and Susan were married and the band relocated to New Orleans. The band released three Long-players and an EP between 1994 and 2001. In the midst of all this activity, Peter released his first solo album, Out Of My Way in 1997. He also spent several years out on the road with Hootie & The Blowfish, adding guitar and keyboards. As the 21st century dawned, Peter and Susan divorced and he returned to the road with bands like NRBQ, the Kennedys and the reunited Bangles. Reconvening with Chris Stamey, the duo released a second album, Here And Now in 2009 and in 2012 the dB’s reunited and released the sublime Falling Off The Sky. Now, six years later, this musical Zelig has finally gotten around to releasing a second solo album, just 21 years after his first. The album kicks into gear with the title track. Leaping out of the speakers, it’s as if we join our regularly scheduled program, already in progress. Smoky harmonica and stinging guitar lattice over a kick-drum beat. The lyrics feel like a pocket history of our hero’s story thus far; “There was this little kid who did just what I did, he learned to play guitar/Became a superstar, then he lost his touch, you might have guessed as much.” Guitar licks snap, crackle and pop, enveloping twinkling piano. The potent melody and sly arrangement belies the narrator’s equivocation. Peter explores a surfeit of styles here, from the Metallic 12-Bar Blues of “In Too Deep” to the reverb-y Punk-meets-Rockabilly workaday rant of “Tuff Day.” Spooky and slightly ooky, the dirge-like “Don’t Ever Leave” is anchored by rippling organ notes that recall mid-century TV personality Korla Pandit. Meanwhile, “Not Right Now” shares some musical DNA with Frank and Nancy Sinatra’s father-daughter duet, “Somethin’ Stupid,” before downshifting into a crafty Cha-Cha-Cha. On three tracks, Peter’s musical ambition is matched by his characteristic droll wit. On “I Got High With You” spiraling power chords align with a modal tabla beat, “Love Me Do” harmonica, sparkling piano, cushioning his deadpan vocal delivery. The lyrics swap intent for the comfort of inertia. Ennui acts as a seductive drug; “When your boyfriend’s gone to bed and you stay up late instead, I’ll get high with you/We can talk about the songs, we can talk about the President, we can talk about it all night long.” The song’s nursery rhyme simplicity is deceptive, locking into a coruscating Continental groove on the chorus as the guitar peels off spiky, concentric licks. 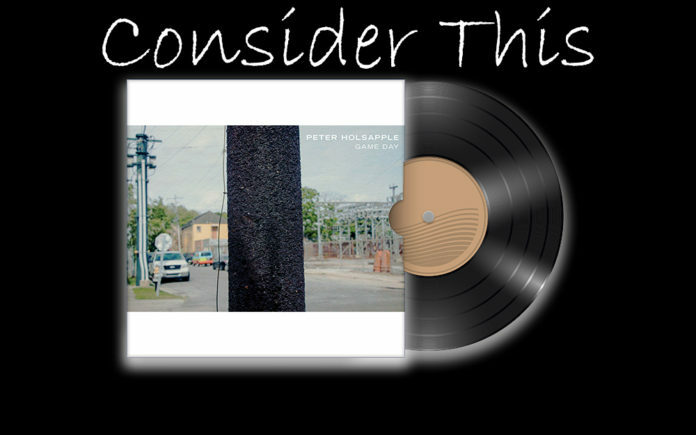 “Common Place” is a wry mea-culpa cloaked in Jangle Pop guitar. A one-sided conversation, much like Sinatra, regrets, he’s had a few. Buttressed by whooshy organ notes, rumbling bass lines and a propulsive rhythm, Peter toggles between failed relationships; “And had I not been young/dumb, I might have seen it coming (up ahead)/The Thrill was in the chase and never in the capture, that’s too common place,” and dashed career expectations; “There’s nothing wrong with being common, we don’t all have to be king.” The song is equally wistful and defiant. The whistle-y/banjo intro to “Yelling…” is a sun-kissed cousin to the theme from the Coen Brothers’ “Raising Arizona,” But the melody quickly shape-shifts into a stompy Waltz. Accented by rippling piano chords, ascending guitar notes and rat-a-tat percussion, exasperated lyrics shake a fist and curse the Gods for a streak of bad luck that includes “…broken deals and sand and glue and paint that peels, exposing what we’re made of.” All the rampant sad-sackery is leavened by the effervescent melody, arrangement and sing-a-long chorus. Three, not-so-hidden bonus tracks offer a musical denouement; There’s a trenchant take of Buddy Miles’ “Them Changes/Sing Lady Sing,” also the fragile PTSD saga, “Don’t Mention The War,” which successfully channels Neil Young, Led Zeppelin and Lynyrd Skynyrd. Finally, the stripped-down grace of “Cinderella Style.” (The latter two songs originally appeared on a limited edition ’45 single back in early 2017). “Game Day” is the epitome of a “solo” effort. Peter not only sings and plays “99 44/100%” of the notes on this record, eliciting help assistance from Susan Cowsill, Webb Holsapple on trombone and Jeremy Boomhower and trumpet and trombone, he also produced the record himself. More than 45 years since he popped up on the musical landscape with Rittenhouse Square, Peter Holsapple’s music still manages to surprise, delight and resonate. He manages the neat trick of wrapping everyday concerns, joys and disappointments in gorgeous and indelible melodies. Hopefully the world won’t have to wait another 21 years for a third solo outing. Next articleSo you want to bet NFL preseason football, do you?